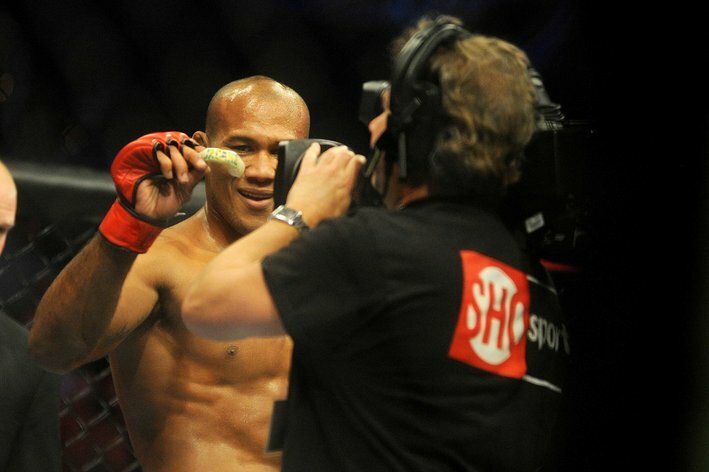 If the UFC wants Ronaldo Souza to fight Yushin Okami next, “Jacare” will happily oblige. After UFC president Dana White told media members prior to UFC 160 that the promotion wanted to book Souza vs. Okami next, Souza’a manager Gilberto Faria told MMAFighting.com that he called UFC matchmaker Joe Silva to inform him that they liked the idea and would accept the fight. “It is up to them now to make that happen,” he said. Faria said he would like the fight to happen in four months because Souza (18-3) wants to take a month off and then needs three months to get ready for Okami. The former Strikeforce champion made quick work of Chris Camozzi on May 18 in his UFC debut, winning the fight via first-round arm-triangle choke. Okami (29-7) has won his last three fights in a row and most recently defeated Hector Lombard via split decision in March. A bout agreement between Yushin Okami and Jacare Souza is in the works with the winner getting a possible fight with Vitor Belfort. Dana White announced at today’s media scrum that the UFC is working on a fight between Yushin Okami and Ronaldo Souza. The event is currently unknown, and bout agreements have not been signed, but that is the fight that the two men are being offered. White also revealed that the UFC has no immediate plans for Vitor Belfort, but the winner of the Okami vs. Souza fight may be in line to face him. Yushin “Thunder” Okami is one of the UFC’s longest tenured Middleweights. For years he was considered a dark horse challenger to Anderson Silva, his only UFC losses coming against Rich Franklin and Chael Sonnen. When his title shot finally did come it was short and violent. One loss followed another with a burtal KO by Tim Boetsch, but since then Okami has seen a return to form. He’s currently on a three fight win streak with decisive victories over Buddy Roberts and Alan Belcher, and a close split decision victory over Hector Lombard. Ronaldo “Jacare” Souza is an old face in a new place, coming off an incredibly dominant UFC debut over Chris Camozzi. He’s one of the worlds most decorated Jiu Jitsu black belts and a decently polished striker. Prior to his UFC entrance he gained notable victories over Alexander Shlemenko, Tim Kennedy, and Robbie Lawlor. He was the Strikeforce Middleweight champion before losing the belt to Luke Rockhold and despite being a recent addition to the UFC is a solid top ten fighter in the division. This is an excellent fight to separate out who’s who at middleweight, but it has real potential to turn into a poor kickboxing contest. Okami is largely a 1-2 fighter on the feet, using basic boxing combinations to set up clinch opportunities and dominating top control. However, the ground is the last place he’ll want to engage Souza, who holds a world of experience and talent over even most of the best MMA grapplers. If Okami does decide to take on Souza in the clinch this could be an exciting fight, if he decides to keep the fight standing at all costs, fans could be in for a long, painful experience. UFC on FX 8: “Belfort vs. Rockhold” took place Saturday night (May 18, 2013) in Brazil, with Vitor Belfort defeating Luke Rockhold by knockout in the main event. Also on the main card; Ronaldo Souza, Rafael dos Anjos and Rafael Natal picked up victories over their respective opponents. Any time a fighter as accomplished as Vitor Belfort steps in the Octagon, there is always something factual of note to bring up. In the case of “The Phenom,” his name in the sport for more than a decade has been built around being one of the most dangerous first-round fighters in not just the Ultimate Fighting Championship (UFC), but in all of mixed martial arts (MMA). The Brazilian proved once again exactly why he has that stigma attached to him on Saturday night (May 18, 2013) with an absolutely devastating first-round head kick knockout of former Strikeforce middleweight champion Luke Rockhold in the UFC on FX 8 main event. The incredible win improved Belfort to 5-1 since dropping to 185-pounds in 2008 and further extended his record for most first-round finishes in UFC history, which only adds to the Hall-of-Fame worthy resume The Brazilian has put together. Belfort’s ability to finish opponents in the first round time after time is unlike anyone else in the sport — that’s a fact. But there were also plenty of other facts to come out of UFC on FX 8: “Belfort vs. Rockhold,” which took place at Arena Jaragua in Jaragua do Sul, Brazil on May 18, 2013. Belfort is the first fighter in history to win two-straight UFC fights by head kick knockout. He is also just the fifth fighter (Anthony Pettis, Anthony Johnson, Paul Taylor, Yves Edwards) in UFC history to earn two knockouts by landing a single kick. Rockhold had his nine-fight win-streak snapped and was defeated for the first time since Nov. 2007 — a span of 2,020 days and 10 fights. 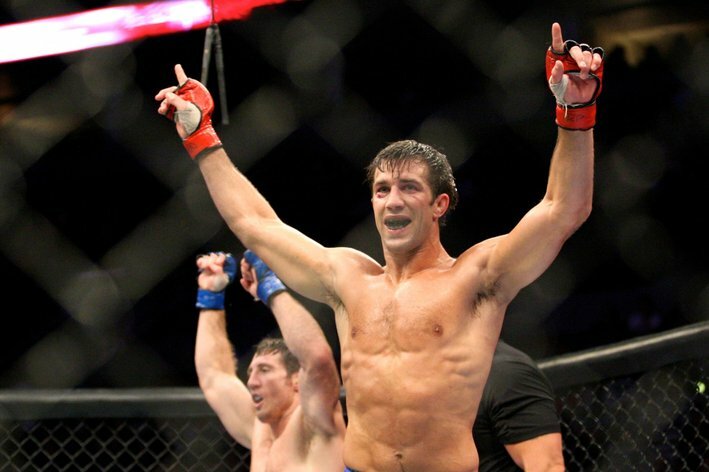 Both of Rockhold’s career defeats are by first-round (technical) knockout. The 28-27 scorecard turned in by judge Doug Crosby in the Nik Lentz vs. Hacran Dias fight was the first in a UFC fight since Alex Caceres vs. Edwin Figueroa at UFC 143 in Feb. 2012. Belfort vs. Rockhold was the shortest UFC main event since Cung Le defeated Rich Franklin by first-round knockout at UFC on FUEL TV 6 in Nov. 2012. Ronaldo Souza has won eight of his past nine fights with the lone defeat coming to Rockhold by decision under the Strikeforce banner. 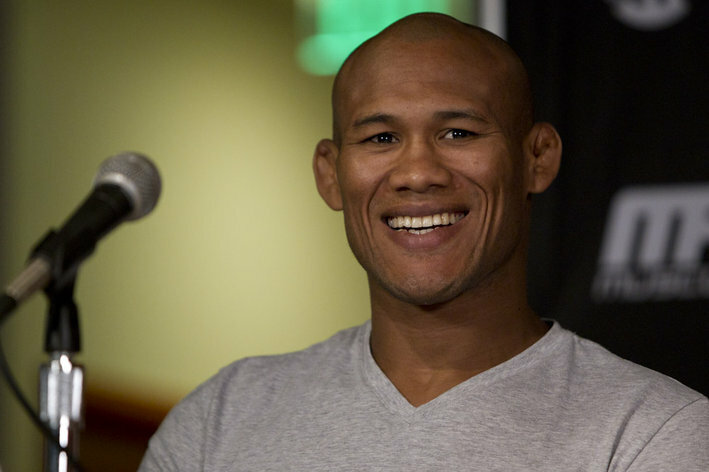 “Jacare” has earned 14 of his 18 professional victories by submission. Fighters making their UFC debut went 1-4 on the card with Souza being the lone victor. Belfort, Souza, Lucas Martins and Jeremy Larsen earned $50,000 post-fight bonuses. John Cholish retired from MMA competition following his second-round submission loss to Gleison Tibau. The 29-year-old was defeated by submission for the first time since Sept. 2007 — a span of over 5.5 years and 10 fights. Belfort improved to 4-0 in the UFC when fighting in Brazil. Yuri Alcantara has earned 24 of his 28 professional victories by (technical) knockout or submission. Rafael dos Anjos tied T.J. Grant for the second longest active UFC win-streak in the lightweight division at four. Champion Benson Henderson leads the division with seven-straight wins. Tibau scored four takedowns against Cholish, pushing the number of total completed takedown in his UFC career to 68, which is second to UFC welterweight champion Georges St. Pierre (84 completed takedowns). UFC on FX 8 reportedly drew an attendance of 7,642. A live gate for the event was not announced. In the seven events the UFC has held in Brazil, Brazilian fighters are 36-10 when facing opponents from other countries. Brazilian fighters went 9-1 against opponents from other countries at UFC on FX 8. After starting his UFC career with an 0-1-1 record, Rafael Natal is 4-1 in his past five fights. Evan Dunham out scored dos Anjos 90 to 86 in total strikes landed in his unanimous decision loss to the Brazilian. Lentz improved to 3-0 since dropping to the UFC featherweight division. Belfort extended his UFC record for most first-round finishes in history to 11. Francisco Trinaldo has finished his opponent by (technical) knockout or submission in all three of his UFC victories. Trinaldo has earned 10 of his 13 professional victories by (technical) knockout or submission. Fabio Maldonado snapped a career-worst three-fight losing streak against Roger Hollett his first victory since Oct. 2010 — a span of over 2.5 years. Maldonado also won a fight by decision for the first time since Sept. 2009 — a span of over 3.5 years and 10 fights. Total cage time for the 13-bout UFC on FX 8 fight card was two hours, five minutes and 32 seconds. Dos Anjos is on his first four-fight win-streak since Oct. 2006-April 2007 — a span of over six years and 17 fights. Betting favorites went 11-2 on the card. Paulo Thiago improved to 12-0 in his career when fighting in Brazil. Belfort tied Roy Nelson for the second-most “Knockout of the Night” bonuses in UFC history with four. Anderson Silva has the most all-time with six. The ZUFFA brass handed out its usual post-fight bonus awards to select fighters coming out of the UFC on FX 8 event last night (Sat., May 18, 2013) in Brazil. Check out who took home the extra coin for their efforts. UFC on FX 8: “Belfort vs. Rockhold” from the Arena Jaragua in Jaragua do Sul, Brazil, has officially wrapped, which means it’s time for those select fighters who went above and beyond in their respective fights to get a little extra grease for their efforts. To the tune of $50,000 each. The promotion dished out its standard post-fight monetary bonuses to four of the 24 fighters on the card, and it’s probably no surprise who’s heading home with a second sack of simoleons. You would be a fool to think that anyone other than Vitor Belfort would win “Knockout of the Night” honors after what he did to Luke Rockhold in the most high profile bout of the evening. That spinning head kick is still spinning and Rockhold’s ears are probably still ringing. Speaking of which, Ronaldo Souza made a successful Octagon debut, absolutely running through Chris Camozzi before finishing him off with an arm triangle choke. He was impressive enough to earn “Submission of the Night” for his efforts. Finally, if you didn’t tune in early, you missed the “Fight of the Night” between Jeremy Larsen and Lucas Martins, who spent three rounds banging it out before the latter knocked the former face first into the canvas to pick up the knockout victory and a sweet bonus check. Again, each fighter received $50,000 extra for their performances in addition to their respective base salaries, which we will pass along as soon as that information becomes available. UFC on FX 8 is just around the corner and earlier today (May 17, 2013), the 8 fighters participating on the televised main card went nose-to-nose at the weigh-ins in a preview of this weekend’s fisticuffs in Brazil. Check it out! Ultimate Fighting Championship (UFC) held its weigh in event earlier today (May 17, 2013) at the Arena Jaragua in Jaragua do Sul, Brazil, for those fighters competing at UFC on FX 8: “Belfort vs. Rockhold” event, which is scheduled to take place at the same location tomorrow night live on the FX channel. The staredowns were nothing to write home about until Vitor Belfort and Luke Rockhold got in each other’s face. The latter leaned too far into the former and earned himself a shove backwards. “The Phenom” promptly throat slashed at the crowd. I think he means he’s going to murder death kill Rockhold inside the Octagon tomorrow night. Or something like that. — If you missed Tuesday’s (May 14, 2013) edition of “UFC Tonight” on FUEL TV, hosts Chael Sonnen and Kenny Florian broke down the top two fights on the UFC on FX 8 main card to give you better insight on how Vitor Belfort vs. Luke Rockhold and Ronaldo Souza vs. Chris Camozzi will play out. Check out the current card for UFC on FX 8, which takes place on May 18th in Brazil. UFC on FX 8 is set for May 18th at the Arena Jaraguá in Jaraguá do Sul, Santa Catarina, Brazil. The event will feature the winner of the UFC on FX 7 headliner, Vitor Belfort, facing off with Strikeforce middleweight champion Luke Rockhold in the main event. The winner could be in line for a UFC middleweight title shot against the winner of Anderson Silva vs. Chris Weidman at UFC 162. 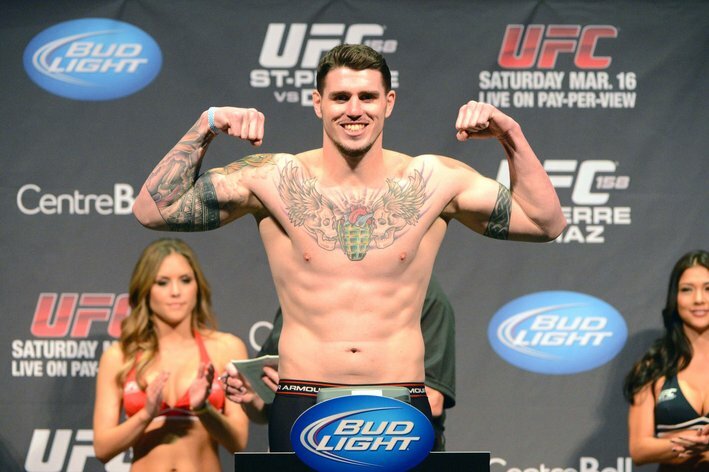 The co-main event will feature late replacement Chris Camozzi against former Strikeforce MW champ Ronaldo Souza. Also featured on the main card is a lightweight showdown between Rafael dos Anjos and Evan Dunham, and Rafael Natal taking on newcomer Joao Zeferino. With Constantinos Philippou injured, Chris Camozzi gets promoted to fight ‘Jacare’ Souza at UFC on FX 8, while Joao Zeferino takes over for “Kamikaze” in is Octagon debut opposite Rafael Natal. Earlier today it was learned that Ultimate Fighting Championship (UFC) middleweight contender Constantinos Philippou had suffered a cut above his right eye in training and would no longer be eligible to compete against Ronaldo Souza at the promotion’s upcoming UFC on FX 8 event at Arena Jaragua in Santa Catarina, Brazil. Get the scoop on that here. With “Costas” down and out, Chris Camozzi has been pulled from his fight against Rafael Natal — also scheduled for the FX-televised broadcast — to take Philippou’s place, prompting the promotion to sign last-minute fill-in Joao Zeferino. “The Brazilian Samurai” is 12-1 since 2007 and is currently riding a seven-fight winning streak. MMA Fighting brought word of the change earlier today. UFC on FX 8 features a hard-hitting headliner between Vitor Belfort and former Strikeforce Middleweight Champion, Luke Rockhold, in the main event. Rafael dos Anjos and Evan Dunham have also agreed to tangle atop the international card.